It always happens. Every time I ride a Triumph, and even though I stop in the middle of nowhere, some old buffer appears. "By eck lad, a Triumph, are they still making those?" or somesuch is inevitably the opening gambit. Now this is all well and good if you are feeling mellow and want to blether, but when the codger in question is standing between you and the bike and you are trying to take pictures before the sun goes in, it can get a bit wearing. With a bit of luck, youll have your helmet back on and be firing up by the time you get to the " ... and back in 1937 I had a Fanshaw-Brunthorpe 250, by but that were a grand bike you know ..."
That Triumph exists at all is amazing, and that they should be making a bike this good after only ten years in business is nothing short of a miracle. I guess it will take more than a few old geezers to stop me feeling downright proud of them. Britain as a manufacturer of motoring appliances, 2 wheels or 4, is heading down the toilet faster than you can say "Rover". And yet here is a genuinely world class bike, at a real world price with a Union Jack on the side. All stand and well hum the national anthem! This is the Sprint RS, for my money the best bike Triumph have ever made, and an absolute belter. It is a slimmer, slicker, sportier version of their acclaimed Sprint ST, and both use a detuned version of the 955 injected triple from the Daytona. Better yet its a triple, and there is something unique about a 3 cylinder layout. In this category every competitor is either a in-line four, or a v-twin copying Ducati these days. Although others can claim to make triples, Triumph has got real heritage going for it here, going back to their own Tridents. I used to have a K75 BMW, a fabulous engine sadly out of production now, and this Triumph feels and sounds like its big brother. What a fantastic engine this is. I cant think of an engine with a flatter response curve, both in power and torque. Open the taps at almost any revs, in any gear and it responds like turning on a switch. It is docile and tractable around town, yet it produces searing acceleration without the merest hint of a power band. It also has such hefty reserves of grunt from the 3,000 to 4,000 range that you can if you want make rapid progress without resorting to hooligan revs. Couple this to some pretty close ratios at the top of the 6 speed box, and a well chosen final drive, and you have a real gentlemans sporting conveyance. There are other bikes from Japan that can do some of this too, but why are they are all painted up like a teenagers bedroom? If you are a sensible motorcyclist, why would you want to ride around on something that looks like a Pokemon barfed on it? Especially in this fabulously restrained dark blue colour, the Sprint RS looks serious, it has attitude, but it is subtle. I love it. I would love to see what a limited edition in British Racing Green, gold wheels, and with no decals would look like, but I digress. I had borrowed the bike from the new Triumph dealership in Perth, Motorcycle King, and it took a while getting used to being back on a sports bike again from my more usual Harley. Cruising up the A9 on a glorious afternoon, and easily passing traffic may sound cool, but beware. Scotlands best road has been festooned with an outbreak of Gatsos, and some of them are hiding behind road signs. Bah Humbug! After about an hour I was getting the feel of the Triumph, and in particular was getting some real confidence in the brakes which are phenomenal. You scarcely need the back brake, and even a delicate squeeze on the front lever will stuff your guts into the tank. Knew I shouldnt have had those chips at lunchtime! Out of Aberfeldy and over the hills to Amulree, mercifully free of traffic and the road clean and gravel-free, and this thing just comes alive. Even with out trying too hard it flows though the corners, holding its line with out a trace of a shimmy. Gas it in any gear and the engine responds instantly, and you notice just how good the ergonomics are, your hands, feet and bum seem to be in a near perfect position. You can clamber about the saddle, or you can just sit there, the bikes not bothered. You can rev it, or just ooze along on the torque, its still not bothered. This is one composed machine, and your confidence in it grows with every mile. 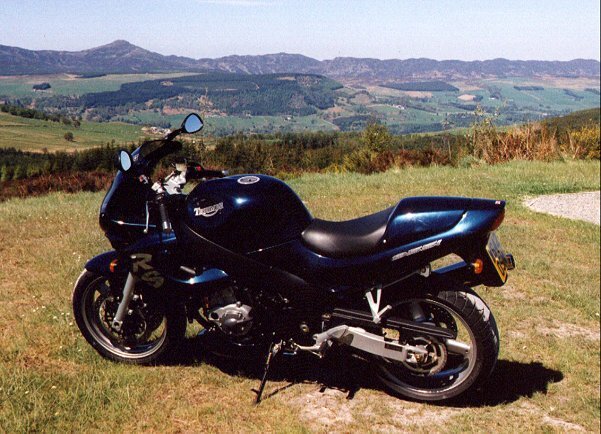 By the time I handed it back after a brilliant afternoons riding, it felt like Id been riding it for years. A good sign that. So what to make of this bike? Triumph consider that it competes with the Honda Firestorm, the Suzuki TL 1000 and the Ducati 900SS, and indeed it does. In power, handling and price they are remarkably close. They are all also very good bikes from long established makers, so to be in the ring with this company, and punching hard too, Triumph can hold its head high. But these are only the obvious competitors. I think there is more to this than simply lining it up against the like priced rivals. Lets face it, there are really no bad bikes out there these days, so what you eventually choose has more to do with feel and emotion and style and fashion than simple figures. The Sprint RS may equate to some of the Japanese bikes, but the important point is that it doesnt FEEL like them. We are talking subjective here, but the Triumph has a solid, planted, slightly heftier feel than most of the current Jap sports bikes. Its neither better nor worse, just different. In fact it reminds me of some of the better sports bikes that BMW make, it shares a certain solidity, and I mean that as a compliment. It may explain why a lot of Triumph riders are ex-Bimmer pilots too! I would probably say it feels British, if only there were any other British bikes around to compare it with! I only had a few hours with the Sprint RS, but it was more than enough to renew my enthusiasm for Triumph as a company, and to end up liking this bike a lot. If only you could park it without some old bloke appearing and wittering in your ear the minute you take you helmet off! With thanks to Motorcycle King, Perth for the loan of the test bike.